Does anybody know anything about this mark? My dad was given this doll and is stumped as to if it is worth anything. 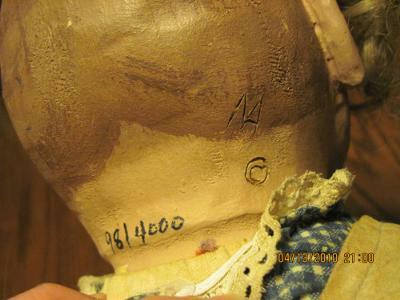 Here is a picture of the Doll Makers Mark on the back of the head. I can send many more pictures if someone can provide me with an email address. I have looked through many books and cannot find any info. I know that you all are experts and may be able to give me some information. Thank you for your help in advance. It is greatly appreciated! Comments for Does anybody know anything about this mark? This doll is very rare and a antique. You should take it to a antique dealer or an appraiser immediately. If this doll is in even decent condition it could fetch you at least $2500. Let me know if you are looking to sell it.. put some more pictures up for me to see. Thank you for your answer! I really do appreciate it. I will send you pictures shortly. Lori, the 98/4000 means this is doll #98 out of a large production of 4,000. It is not a maker's mark. Must be a modern doll.